We’d love your help. Let us know what’s wrong with this preview of Hey, Water! by Antoinette Portis. Join a young girl as she explores her surroundings and sees that water is everywhere. But water doesn't always look the same, it doesn't always feel the same, and it shows up in lots of different Splash! 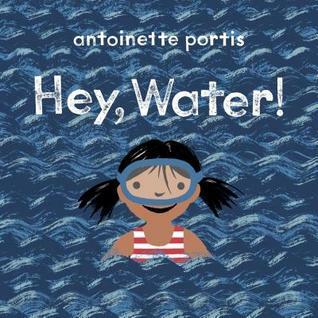 A spunky little girl plays a spirited game of hide-and-seek with water, in this gorgeously illustrated nonfiction picture book. To ask other readers questions about Hey, Water!, please sign up. Be the first to ask a question about Hey, Water! This is a delightful and kid-friendly nonfiction picture book about the many ways in which water surrounds us. The text is minimal, with simple secondary text (in smaller font) on many pages to clarify the content: ICEBERG (a rock that floats) or RIVER (rushing to the sea). Back matter describes the states of water (gas, liquid, solid) and other science content, making this a perfect pairing with Miranda Paul's WATER IS WATER. Consider pairing (tripling it!) also with Luxbacher's DEEP UNDERWATER This is a delightful and kid-friendly nonfiction picture book about the many ways in which water surrounds us. The text is minimal, with simple secondary text (in smaller font) on many pages to clarify the content: ICEBERG (a rock that floats) or RIVER (rushing to the sea). Back matter describes the states of water (gas, liquid, solid) and other science content, making this a perfect pairing with Miranda Paul's WATER IS WATER. Consider pairing (tripling it!) also with Luxbacher's DEEP UNDERWATER, especially the visuals, including endpapers. The three titles also provide excellent text models: rhyming informational text, parallel informational text, and a dreamy-magical semi-narrative text in first person voice. A very cute and simple introduction to water for preschoolers. There's some sources in the back for further learning about water, and also a pretty nice water cycle chart. This book rejoices in water in all its forms and disguises, coming from any number of sources, and interacting with the world and the people who live in it. Lyrical text combines with brush and ink illustrations that have been digitally colored, showing a variety of perspectives. This would be nicely combined with "Ice Boy" for a story time about the water cycle. Spunky little girl discovers with great delight that water is everywhere. Could pair with "Water is Water" for a lesson. The brush strokes and methods used to paint water are stunning! I had the pleasure of listening to Antoinette Portis talk while she was working on this, which makes me appreciate the artwork more than I otherwise may have. The text was a bit abstract for youths, and it wasn't informative, but it was a nice read. This is a really cute and well-done book, like all Portis books are. Antoinette attended the UCLA School of Fine Arts and is a former creative director at Disney. She lives in Southern California.